You may have noticed a few Aodh Ruadh players going about with rather strange hair-dos recently, and some with no hair at all. It's not some bizarre deviant Jedward-style viral outbreak, there's a perfectly reasonable explanation for it all. 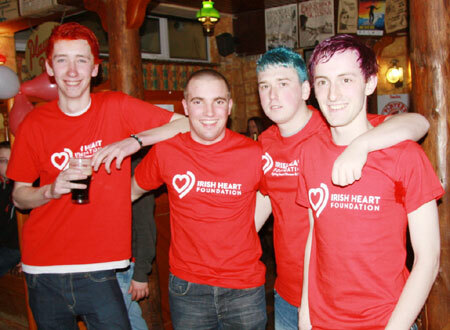 Conor Gallagher organised a group of young lads to get together to raise funds for the Irish Cancer Society, under the umbrella of Today FM's Shave or Dye appeal. The lads who signed up were Philip McGowan, Peter Boyle, Oisin O'Malley-Daly, Chris McCauley, Slim Langan, Jack Gallagher, Keelan Waters, Ronan Drummond, Liam Devanney, Marty McGrath and Conor Gallagher himself. 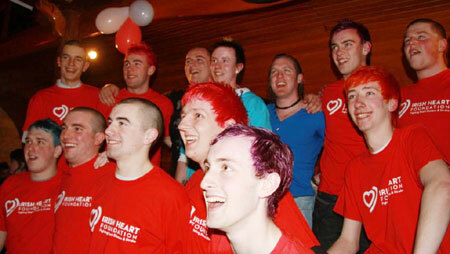 We have some before and after pictures of the hair-raising exercise session last Friday night. The lads raised a good sum for a great cause, at no small personal embarassment. If you'd like to donate further, then don't hesitate to contact the lads with your contribution, I think it's fair to say they've earned it the hard way.